The Law on Chemicals is the overarching regulation in Vietnam that regulates the activities related to chemicals and chemical industry. 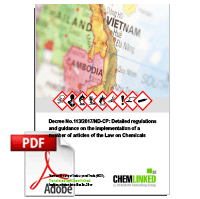 Since the publication of the Law in 2007, Vietnam government has been promulgating new implementation guidelines and revisions to the Law in order to align the regulatory requirements with latest developments and demands in the chemical industry. In Oct 2017, Vietnam Ministry of Industry and Trade (MOIT) published a chemical decree named No. 113/2017/ND-CP and replaced Decree No. 108/2008/ND-CP which had been in force for 9 years. Decree No. 113/2017 functions as an implementation decree to the Law on Chemicals.